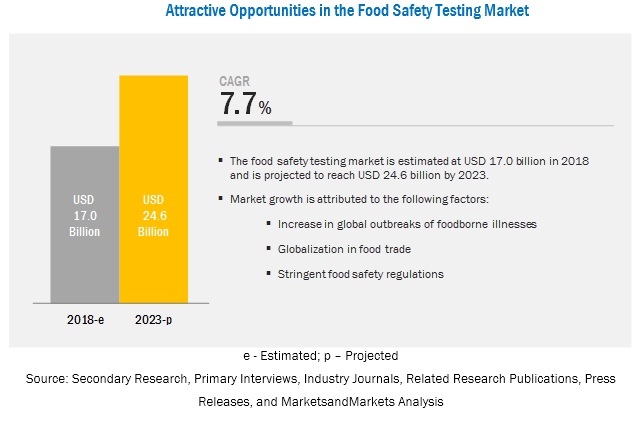 [235 Pages Report] The market for food safety testing is projected to grow from USD 17.0 billion in 2018 to USD 24.6 billion by 2023, at a CAGR of 7.7% during the forecast period. This is attributed to the growth in demand for convenience and packaged food products, an increase in outbreaks of chemical contamination in food processing industries, and the rise in consumer awareness about food safety. However, the increase in global outbreaks of foodborne illnesses and globalization in food trade drive the demand for food safety testing services. By target tested, the GMO segment is projected to be the fastest-growing type in the food safety testing market during the forecast period. The fastest growing market of GMO is attributed due to Increase in consumer awareness for genetically modified organisms in food, and efficient technological trends are expected to drive the global market for GMO testing. Lack of information about the nutritional and safety properties of genetically modified food leads consumers to think that they are not safe for consumption, thereby driving the market for GMO testing and labeling. The meat, poultry, and seafood segment is projected to account for the largest market share during the forecast period. Among foods tested, the market is estimated to be dominated by the meat, poultry, and seafood segment in 2018. The contamination of meat & poultry products is often observed during processing, packaging, and storing. The Food Safety and Inspection Service (FSIS) has framed regulations to control the contamination of meat & poultry products in slaughterhouses and processing plants, based on the HACCP food safety control system. A major factor that drives the growth of the seafood testing service industry is the high demand for seafood products such as crustaceans, shrimp, crabs, lobsters, tuna, marlin, and swordfish, due to their nutritional values such as the presence of omega fatty acids and other essential nutrients. The European market accounted for the largest share in the food safety testing market. European countries have recorded many issues related to food safety over the past few years. As a result, stringent policies have been regulated to implement complete food safety for the public. In Europe, food safety policies have been emphasized by efforts from Control Laboratories (CLs), National Reference Laboratories (NRLs), and EU Reference Laboratories (EURLs). These authorities have played an important role in maintaining food standards and protecting consumer health by ensuring the quality of the food supply chain. The major vendors in the global food safety testing market are SGS (Switzerland), Eurofins (Luxemburg), Intertek (UK), Bureau Veritas (France), Mérieux (US), ALS Limited (Australia), TUV SÜD (Germany), and TÜV Nord Group (Germany), Microbac Laboratories (US), AsureQuality (Australia), FoodChain ID (US), Romer Labs (Australia), Symbio Laboratories (Australia), and RJ Hill Laboratories (New Zealand). These players have broad industry coverage and strong operational and financial strength; they have grown organically and inorganically in the recent past. The industry players, such as SGS (Switzerland) acquired Oleotest NV (Belgium), a provider of chemical testing services for food, feed, and agricultural commodities. This acquisition was expected to provide the company an entry into a complementary segment for chemical analyses, thereby strengthening its leading position for agriculture & food testing in Belgium, in April 2018. In January 2018, SGS acquired Vanguard Sciences Inc. (US), a provider of microbiological, chemical, and physical testing for food products. This would help the company in expanding its existing testing capabilities in the US. In October 2018, Eurofins acquired EnvironeX Group Inc. (Canada), a provider of testing services to the environment, agriculture, food, and health & pharmaceuticals sectors with three laboratories in order to expand its presence in the Canadian market. In April 2018, Eurofins signed an agreement with LabCorp to acquire its food testing and consulting business—Covance Food Solutions for USD 670 million. In July 2018, Eurofins acquired LABORATORIOS ECOSUR S.A. (Spain), one of the leading providers of food testing services in Spain. The acquisition significantly strengthened the company’s footprint in Spain. Who are the major market players in the food safety testing market? What are the regional growth trends and the largest revenue-generating regions for food safety testing? Which are the major regions that are expected to witness the majority of the growth in food safety testing? What are the major targets tested for different food products that are expected to gain maximum market revenue and share during the forecast period? Which is the major technology of food safety testing that will be accounting for the majority of the revenue over the forecast period? The study involved four major phases in estimating the market size for the food safety testing market. Exhaustive secondary research was done to collect information on the child markets. These findings, assumptions, and sizing were validated with industry experts across the value chain through primary research. Both the top-down and bottom-up approaches were employed to estimate the complete market size. Thereafter, market breakdown and data triangulation were used to estimate the market size of segments and subsegments. In the secondary research process, various sources were referred to, so as to identify and collect information for this study. These secondary sources included reports from the Food and Agriculture Organization (FAO), United States Department of Agriculture (USDA), Food Safety Management System (FSMS), Food Safety Council (FSC), European Food Safety Authority (EFSA), Food Standards Australia New Zealand (FSANZ), Canadian Food Inspection Agency (CFIA), Mexico’s National Service of Health, Food Safety, and Agro-Alimentary Quality (SENASICA), Food Safety Commission (FSC), Ministry of Health, Labour and Welfare (Japan), and Food Safety and Standards Authority of India (FSSAI); annual reports; press releases & investor presentations of companies; white papers; certified publications; and articles by recognized authors, regulatory bodies, trade directories, and databases. 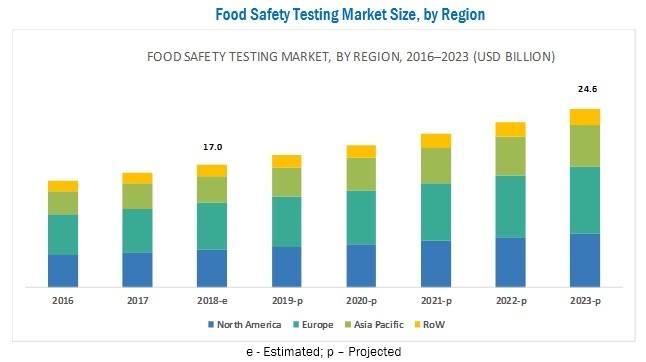 The overall food safety testing market comprises several stakeholders such as manufacturers, importers & exporters, traders, distributors, and suppliers of food safety testing kits, equipment, reagents, chemicals, and other related consumables, food safety testing laboratories, food raw material suppliers, food ingredient, intermediate, and end-product manufacturers and processors, Government organization and research institutions in the supply chain. The demand side of this market is characterized by the growing food industries, the contamination cases, and an increase in foodborne outbreaks from food-based products. The supply side is characterized by advancements in technology. Various primary sources from both the supply and demand sides of the overall market were interviewed to obtain qualitative and quantitative information. The primary interviewees from the demand side include personnel from the dairy, meat, poultry, and seafood, fruits & vegetables, processed food, and cereal & grain industries; research institutions involved in R&D to introduce new technologies; and food safety associations. The primary sources from the supply side include key opinion leaders, vice presidents, and CEOs of the key manufacturing companies in the food safety testing industry, food importers, and exporters. The food safety testing industry’s value chain and market size in terms of value were determined through primary and secondary research. After arriving at the overall market sizes-using the market size estimation processes as explained above-the market was split into several segments and subsegments. In order to complete the overall market engineering process and arrive at the exact statistics of each market segment and its subsegments, the data triangulation and market breakdown procedures were employed wherever applicable. The data was triangulated by studying various factors and trends from both the demand and supply sides of the food safety testing industry. The market size was validated using the top-down and bottom-up approaches. This research report categorizes the food safety testing market based on target tested, technology, food tested, and region.